Huge trophy cabrilla for Michael Nuttbrock from West Linn, Oregon, who was down with his dad, son and brother and got in some good fishing this past week. Off the lighthouse, Myles Panze got into the yellowtail bite with some nice slug forktails that were in the 25-30 pound class. They said the bite was early. They also got a big striped marlin and lost another one. Thirteen-year-old Ayden Nuttbrock had himself quite a week of fishing with dad, uncle and grandpa. From Oregon, he got yellowtail, pargo, marlin, bonito and even this dorado! Captain Jorge with our Tailhunter Las Arenas Fleet helps Riley and Brady Dunn from Boulder, CO, who were able to squeeze in one day of fishing with us and made the best of it. Brady hooked this nice striped marlin while Riley said he “drank beer!” It was their first time fishing in La Paz and they donated all the meat to the pueblo. Three generations…Michael…son Ayden…grandpa Don from Oregon started their fishing week off with some nice yellowtail. They’re standing on the beach posing at Bahia de Los Muertos. Ken Errair got in some fishing before the winds started coming up later in the week and stuck it to this really nice amberjack. You can tell by the jacket and rough water behind him it’s started to get chippy! She always does well anytime she comes fishing. Taylor Murphey from Long Beach holds up two of yer nice yellowtail she caught earlier in the week. First timer, Andy Nuttbrock, holds up his striped marlin he caught off Muertos Bay. The fish could not be released and the meat was donated. He and his family actually hooked three marlin. WHAT A DIFFERENCE A WEEK WITHOUT WIND MAKES! What a crazy week! With the winds all month literally blowing everyone off the water, we could only hope for the best and prepare for the worst. Fortunately, being off-season, we don’t have alot of fishermen these last few weeks when it was hard just getting bait or standing up in the pangas…or even getting out…let alone catching a fish. Well, this past week, we finally got a break and the winds took it easy on us and took a week off. What a difference a week makes! We got quite a variety of fish. Nothing crazy, but some really nice fishing especially for alot of our first timers. We got just about everything except tuna! Talk about variety, we had cold and warm water species mixing it up. There were striped marlin and sailfish between 100 and 120 pounds . We had some medium-sized 30 pound rooster fish near the shore. There were 20-30 pound yellowtail and even some amberjack off the deep hole near the Las Arenas lighthouse and at the south end of Cerralvo. There were some big-boy pargo and cabrilla plus bonito and some sierra. We even had a few dorado and some wahoo biters that broke off. From day-to-day, we never knew what was going to bite or what the anglers would come back with. It was a surprise every day and in between each panga. And that was our week. Right at the end, things started falling apart again as Hurricane Sandra started forming up to the south of us. It never showed up, but it did send up winds and some rains to the area and well…there went the fishing. As I write this, the winds are slated to blow again through about mid-week before it lets up again. Hope everyone had a safe, happy and peaceful Thanksgiving! From Napa CA, Danny McPhee gets an assist from Captain Victor on another big roosterfish they caught close to shore near Punta Perrico. Dan and his brother, Bob, got 5 big roosters between 40-60 pounds and released all of them. These were their first roosterfish. In rough water near the Las Arenas lighthouse at the drop-off, Taylor was jigging and hooked this color-ful amberjack. She was with her uncle, Roger Thompson, who says commercial guys using bait were catching yellowtail nearby. Here’s a fish you don’t see often. A tasty sheephead caught by Joel Zarmati. I don’t think I’ve ever posted a sheephead photo in the 20 years that I’ve posted my fishing reports! I’ve seen them occasionally when scuba diving but never seen one caught. Joel lives in El Sargento. Bob McPhee gives a grimace as he and Captain Victor try to hold onto a struggling roosterfish long enough to take a photo and releasing the big fish. Bob and his brother Dan had a double hook-up on the roosters with both anglers bent simultaneously. Winds were again the big story this week. Two weeks in a row, the northern winds ripped in with speeds over 20 mph and some gusts over 30 mph. Fortunately, it’s already off-season. Not many fishermen and those that did go out knew it would be rough and perhaps not very productive. Many of our folks right now are coming from colder areas so they’re just happy it’s not snowing! The sun is still out and it’s honestly a pleasant 84 degrees most days. Except for the winds if you’re on the water. All week the La Paz port captain had his yellow warning flags out, but honestly, if you’d seen what our calm La Paz bay looked like all week, it was like a froth. Waves crashed on the malecon waterfront tossing spray on passing cars. There were wind-driven waves on some beaches that were easily surfable on a boogie board and one of the huge navigation buoys was torn from it’s chains and tossed up on the shore. We have many friends who are sailboaters in La Paz and even they thought it was best to just tie up to the docks and drink beer! However, as mentioned, we did have some hearty folks out there who did brave the elements and still had a good time. Not much going on offshore and frankly too rough. Plus bait is an issue when big winds make waves. Big waves make it hard to get bait. But, inshore the were decent catches of pargo, cabrilla and some huge triggerfish. Plus a few yellowtail hooked (and lost). Best bite was on the rooster fish. Towards the end of the week as the winds calmed down, commercial anglers using live bait were hooking some yellowtail so we want to keep an eye on that. But roosterfish produced the larger fish of the week. I’m really surprised that they are here this late. Still, some 10-60 pound fish hanging out close to shore. If you’re not looking to bring home any meat, these fish are great sport and there’s nothing like tying into a 40-50 pound beast on light tackle. But all of them are getting released for the most part as the meat isn’t very good eating. This week, winds look like they might calm down a bit so hopefully fish will be more cooperative. Although fishing was tough, Will Dolinar from Rock Springs, WY, says, “It’s snowing back in Wyoming!” He roughed it with us this week and while out with Captain Jorge, his wife Stacey hooked this blue marlin. After a few minutes, she handed it off to him and he fought it for almost 2 hours. The fish could not be released and they donated most of the meat to the pueblo. Despite bouncy rough water, Captain Jorge got Stacey Dolinar on this feisty roosterfish just at the mouth of Bahia de los Muertos. The fish was released. It seemed this week that if you were fishing in all this wind, you either got little tiny pargo and cabrilla or you got a BIG fish like a rooster, marlin, sails or wahoo…and precious few of those. However, on their last day, Bob Donohue from Washington fishing with Captain Pancho, Bob put the wood to this striper. After the quick photo, Bob was able to release the fish! Note that chop in the back! Not much to say this week except the winds were bad and the fishing was worse. If you were in the city it was gorgeous sunny 85 all week. But being on the water was probably someplace not so good. We had maybe the strongest winds of the year, short of there being an actual storm. Winds up to 20 mph with gusts to 25 blew most of the week along with huge tidal surges that not only swamped low-lying areas, but the winds generated almost surf-able waves in La Paz Bay that were strong enough the smash against the La Paz malecon (waterfront) and throw spray on the sidewalk and cars! Much of the bay looked like white froth. Normally, our calm little bay looks like a lake and generally, we don’t see these kinds of winds until maybe late December. But, I think El Nino just has everything all outta whack. In terms of fishing, for the 2nd straight week, we did not send any fishermen out of La Paz. Even had it not been howling winds, the waters have been turned over. There’s very little bait and what few fish that are around have been way over on the other side of the bay almost 90 minutes ride away. So, we’ve fished all of our folks with our Tailhunter Las Arenas fleet out’ve Muertos. At least the bay is south facing and somewhat guarded against the north winds. But, even then, there’s only so much protection. Once outside, it was choppy and rough. Bait is already an issue, but when the winds blow, it’s even worse trying to find it or, in the areas close to shore where we net it, the huge waves scatter the small baits or make it impossible to get close to the rocks. However, some days the guys were able to scrabble up some mackerel, caballitos or other baitfish. But not much. So, that surely impacted the fishing. Being that it’s already off-season, the upside is that there are very few fishermen in town compared to a few weeks ago. It’s just too bad the winds came up early this year…a month too soon. Normally, we’re still whacking fish right now. But, the downside is that we still have some fishermen visiting us and there wasn’t much to write home about. The amigos we had out this past week really put in a valiant effort and kept the smiles on despite the lack of fish and rough water. High-fives to all of them…they hung in there! There were some marlin and sails hooked. But there was not much “in-between” in terms of roosters or dorado, bonito or other species. One wahoo hooked and lost. The rest were just some small pargo, cabrilla and trigger fish. Oh…a couple of 50 pound roosterfish that were a nice change-up, but can’t east roosterfish and all releasd. That was pretty much it. As I write this, winds are calming just a bit, but are slated to start up again the middle of next week and blowing Tuesday, Wednesday and Thursday…again! I’m really tired of El Nino. Go away already. Not a great way to wind down the season the last few weeks. Roger Thompson puts another one on the boat. He was dragging his favorite dark Rapala and this nice wahoo bit. He was dragging on the SW end of Cerralvo Island. There’s still some wahoo around but no regular biters. Normally, November is a good time for wahoo hunting. Ed Sorensen from Monrovia CA spent 3 days fishing with us and Captain Gerardo. He got 4 nice roosterfish between 30 and 50 pounds on live bait and all released. Great shot of our Tailhunter Team this past week in Cabo San Lucas at the Los Cabos Western Outdoor News Tuna Jackpot. 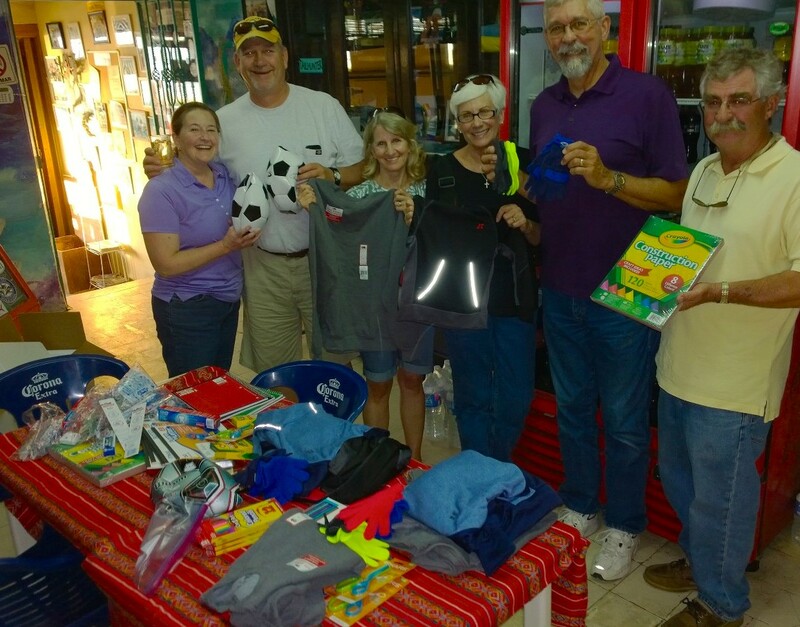 Thanks for our amigos, Bob Sayre, Bob Duncan, Jorge Romero and Omar Osario (Capt. Boli) and the Fin-Addict Sportfishing. 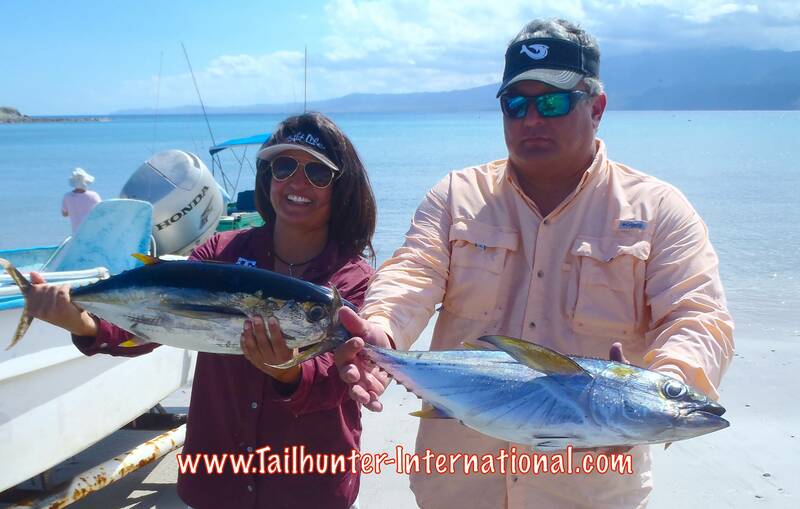 In three days fishing, our Tailhunter Team guys picked up one marlin, 5 dorado and 1 wahoo. Well done and gracias! Sky view of the long-awaited new toll road from the Los Cabos Airport towards La Paz. Seasons have definitely changed, not just for us in La Paz, but from what we’re hearing in other areas of S. Baja as well. Northern winds seem to have moved in and are blowing pretty consistently which is indicative of cooler air and water temperatures. It makes for rougher fishing and fewer warm-water species. Winter conditions aren’t far behind. If the winds continue, we’ll be fishing mostly inshore species before too long. It’s still a pretty time to be in Baja. It’s great vacation temperatures with daytime temps comfortably in the mid-80’s and nighttime temperature pleasantly in the mid-60’s. We haven’t really sent out too many of our fishermen and boats out’ve La Paz now for almost 2 weeks. It’s been tough fishing. Northern winds have made it choppy and rough. Even tho’ it might look calm in the bay, outside it can look like a washing machine. Bait has also become a problem. Some days, no bait is available until late in the morning. Even moreso, the fish we’ve been finding have been far on the other side of La Paz Bay near San Juan de la Costa. That’s a long long run after already a long run looking for bait. San Juan de la Costa is over an hour run to get there. Then…when we have fished the area, we’re finding only 1-3 little dorado or some sierra. More or less, unless something dramatic happens, I think we’re done fishing La Paz side and Espirito Santo Island for the rest of the season. This is where we’ve been doing most of our fishing recently. Having our boats launching out’ve Bahia de Los Muertos they are at least more protected from the winds blowing from the north since it’s a south-facing bay. However, it has still been bumpy out there some days once the winds start up. The winds create another aspect. The winds make it hard to get bait. If waves are battering the bait areas, the bait scatters or makes it hard for the pangeros to get in close to throw their nets. Without bait, it makes it harder to fish or we revert to fishing for lures…or trolling…which isn’t much fun anyway if it’s rough and you’re in a panga. The other side of the coin is that winds force us to fish closer to shore for pargo, cabrilla, jacks, and sierra. All good fish, but surely not the glamour pelagic species folks come for. That being said, we were still getting some decent rooster fish the last week or so that ran 30-60 pounds (all released). There were also a few sailfish and marlin hooked and released. Rapalas near Cerralvo Island and not far off Punta Perrico produced a few wahoo as well as some really early season yellowtail in the 20-pound class. Well, it finally happened. We’ve been waiting for them to open the new road from Los Cabos Airport. It’s been completed for several weeks, but required Mexican President Nieto to do the official ribbon-cutting ceremony. He was in town last week and the deed was done! The new toll road from the Los Cabos Airport bypasses the slower tourist corridor between San Jose and Cabo San Lucas. For those anglers and tourist traveling to La Paz, the 100 mile trip has been taking 3 to 3 1/2 hours. The new road should cut down the trip to approximately 1 hour 40 minutes! Cost is about 70 pesos, I understand…about 6 dollars. Not just the best catch of the week…maybe one of the best of the season! 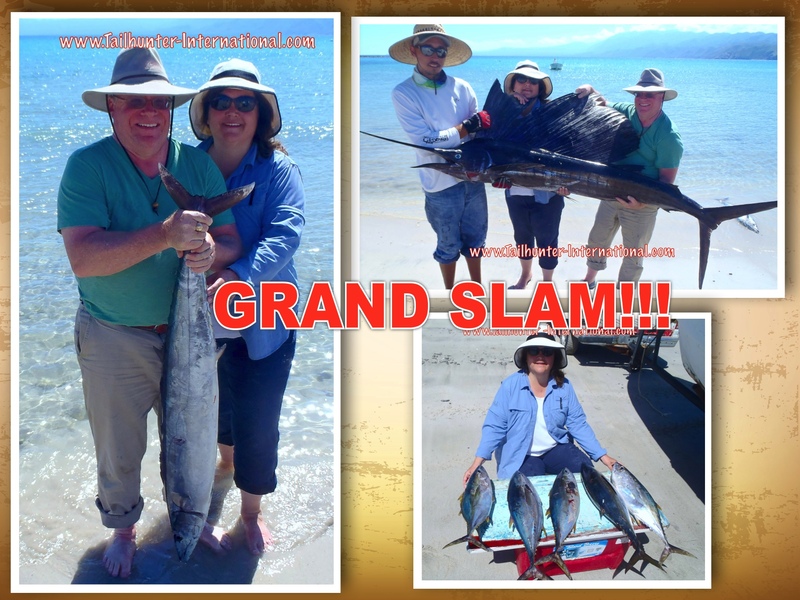 When someone catches three or more kinds of sportfish in a day, we call it a GRAND SLAM! Richard and Sue Marksberry from Herndon, Virginia had never fished in the ocean before. They had never fished in Mexico. 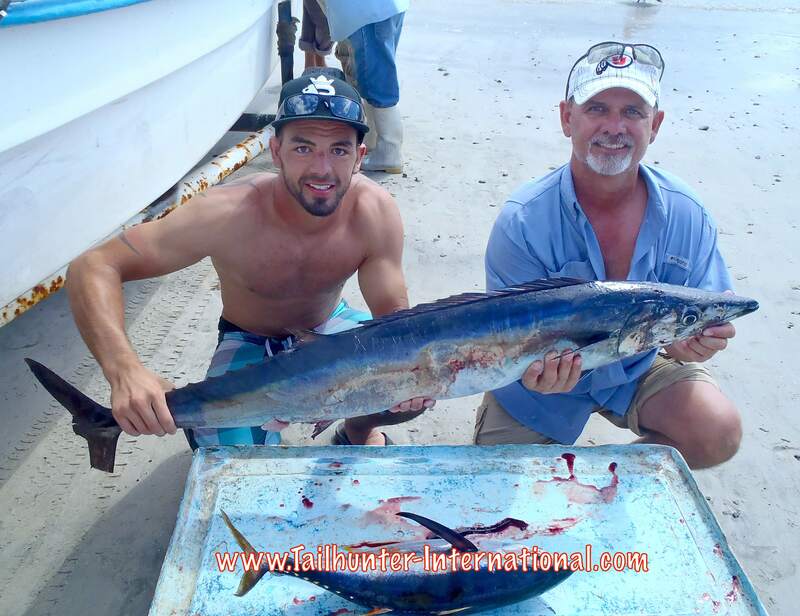 They got 5 tuna, then caught a sailfish; then caught a wahoo! On top of that, they got pargo, cabrilla, bonito, jack crevalle and roosterfish. They let most of their fish go or donated fish to the pueblo. Nicely done! They set the bar pretty high for future trips! Nice way to end the trip for Kyle Herrera from Kaysville UT and his dad Channing. The got into the tuna early in the week then topped things off their last day with a nice wahoo as they were coming back to the beach with the panga! Tom Mullican, from Idaho, is one of our great Tailhunter amigos. He spent the last two weeks here struggling through the difficult bite, winds, hurricane waves and lack of bait and never gave up and kept smiling. During that tough bite, he and Captain Archangel suddenly found themselves with THREE sailfish hooked up at the SAME TIME!!! He said it was wild. All on lighter tackle. One got unbuttoned right next to the boat. Another was released and swam strongly. The last one could not be revived which is shown here on the beach. Tom donated the meat! Once-in-a-life-fishing! Good job, Tom! 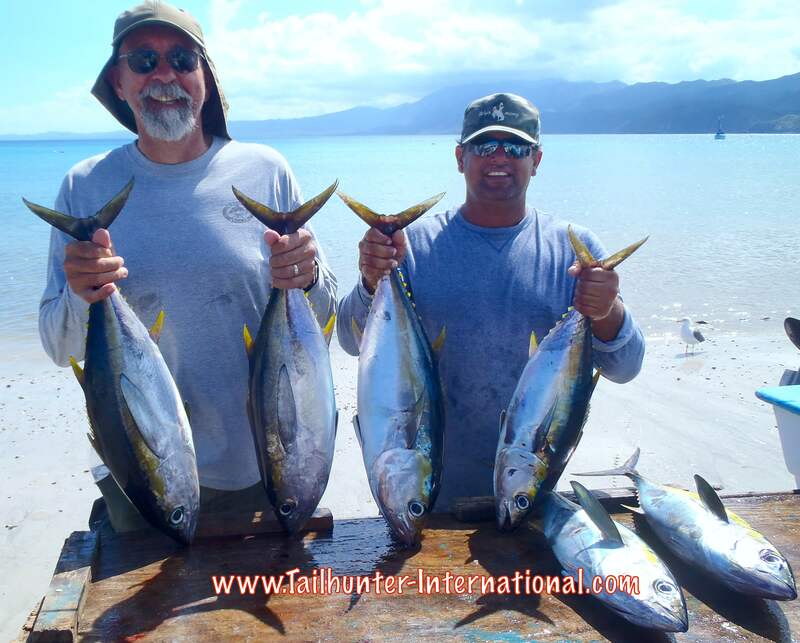 Early in the week when the tuna cooperated, Dave Codding with Captain Armando and a nice rack of yellowfin tuna that Dave caught with wife, Gail. They donated all the meat to families in San Pedro. They also left donations of money for our FANLAP scholarship program. Despite tough fishing all week, Barbara Choate, was gonna keep fishing and outfish her husband and the rest of the guys. She’s got the best laugh! 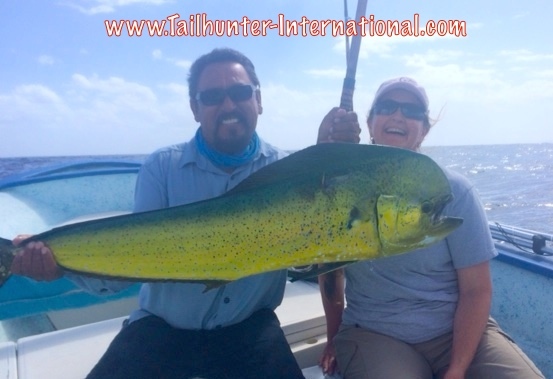 Well, she came through on the last day with Captain Jorge and caught what might be the largest dorado of the season. We’ve caught alot of dorado this year, but a fish over 10 pounds has been rare. It’s been a strange year. But this one might be in the 20-25 pound category! 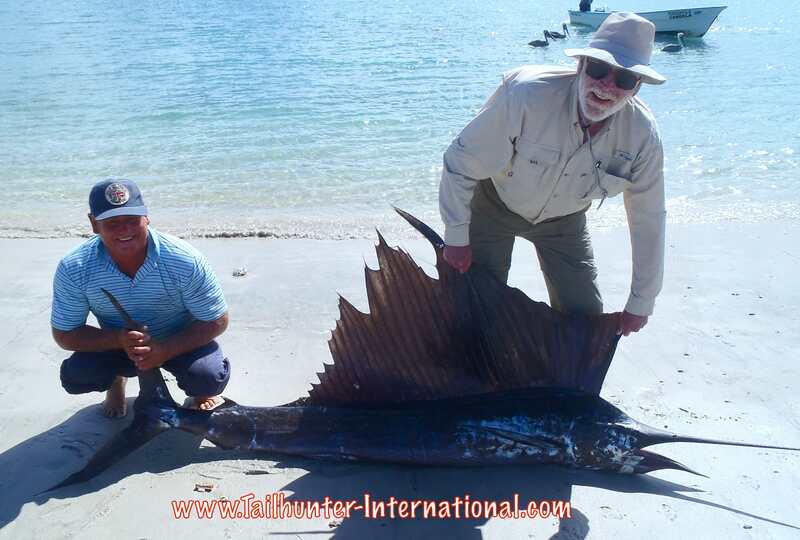 Dave Codding from Idaho and Captain Armando with a nice marlin. Dave had caught other billfish, but had never done it like this on light tackle and it battered him for almost 2 hours. The fish could not be released and he donated the meat to folks in the pueblo. A beast! 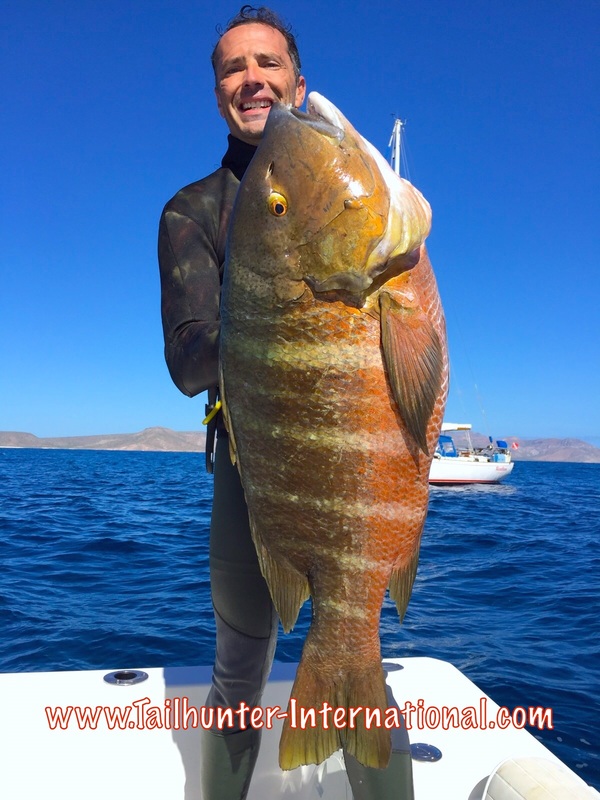 Matt Deichsel shot this huge barred pargo while freediving and it might be a new spearfishing world record. They brought the monster to Tailhunters where we have a certified IGFA scale and it topped out at 38.5 pounds almost 2 pounds heavier than the current world record. The papers have been submitted and hopefully qualifies! Two of our newest amigos! Tammy and Donnie Van Ness from Texas came looking for a trophy rooster that evaded them, but they did get some of the yellowfin tuna. 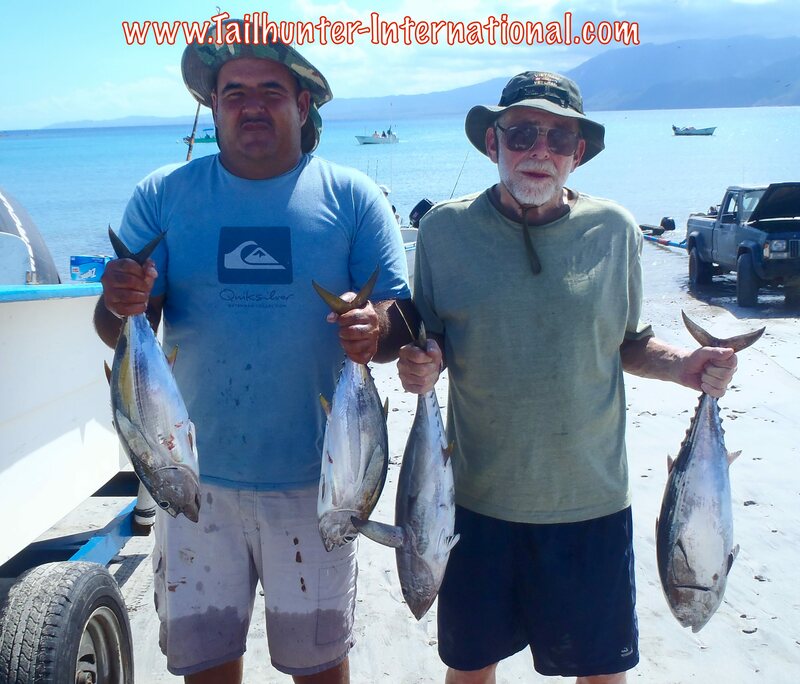 With Captain Gerardo of our Tailhunter Las Arenas Fleet, John came to us all the way from New Jersey and shows off a few of his yellowfin tuna. 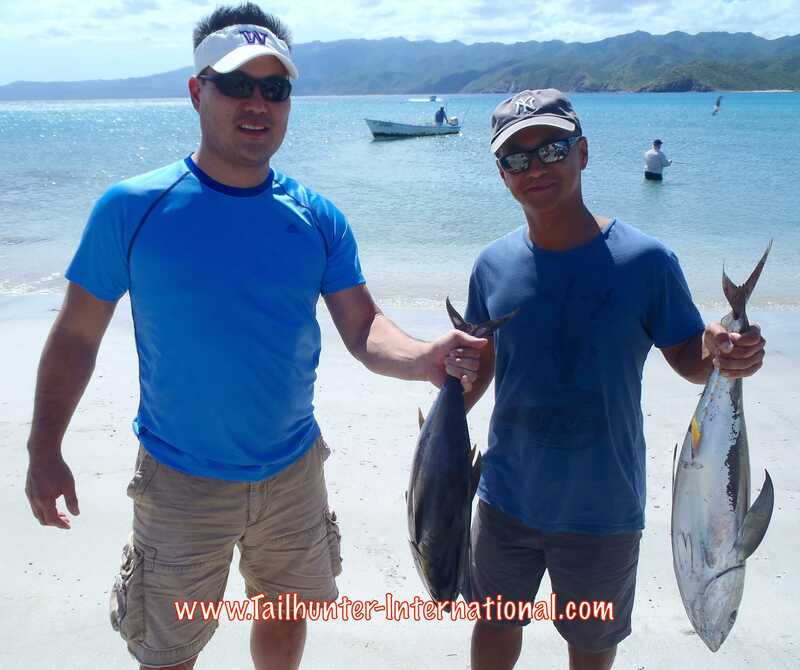 From Oakland CA, Dave and Lou Hong with a couple of their yellowfin tuna. Without mincing words, this was by far the toughest week for fishing of the entire year. Honestly, a struggle for the anglers and the captains. The way we’re set up, we have two fleets. For those of you who have fished with us, you know how we’re set up. Our other fleet is our Tailhunter Las Arenas/ Muertos Bay Fleet that fishes around Cerralvo Island. This time of year, both sides are usually producing some fantastic fishing with everything from billfish to wahoo and tuna to dorado and others in between. This is prime time right now. On the rare occasion that one side is not doing well (either because of wind, weather, bait, etc.) , the other side is always productive and we easily move our clients to the other fleet so they can continue to get bit. It’s worked like that for the 20 years we’ve been here. I don’t know what happened this week, but the ocean turned into a desert for fishing on both sides. Poor fishing doesn’t even begin to describe things. The week started out promising with tuna and billfish for our Las Arenas fleet and then dorado for our La Paz fleet. About Tuesday, the whole place just sort of shut down. We had trouble buying a bite. It was ridiculous. What happened? For the last 3 weeks or so, football-sized yellowfin tuna between 8 and 20 pounds have been a real nice treat in that area just south of Muertos Bay. As well, sailfish and marlin have been moving through the areas and providing a great bonus bite. Wahoo were also in the area. So were rooster fish! We were getting 3-10 tuna on the average per panga per day. That was the bread-and-butter-fish. Then, it just shut off. Nothing. Nada. Boats were catching nothing or coming back with a cabrilla and a trigger fish! Several factors seem to have been involved. 1. No bait. Our lifeblood is having live bait. The sardines and other baitfish just disappeared or became nearly impossible to find. No bait. No bites! After a few days of futility, word among the captains was that commercial boats and pangas from “down south” had swooped in during the night with small-mesh nets and taken all the bait. Lovely. 2. Residual wind and waves from Hurricane Patricia didn’t help. Patricia late last week that hit the Puerto Vallarta area was the strongest hurricane ever recorded in the western hemisphere. It had winds over 200 miles and hour and rains are still being felt up in Texas. We’re 500 miles away, but lots of water got pushed up our way and created big rolling swells that also pummeled the shallow areas where the sardines are often found. Plus, the rollers got people seasick that normally don’t get seasick. I think I had more people seasick this week than the entire year put together. The winds from the south added chop to the area and then seasonal winds from the north that start up this time of year anyway, turned the waters into a swirl. 3. Full moon. Huge full moon. I usually don’t put much stock in the full-moon superstition. You either fish or you don’t. Some of our best bites have taken place during the full moon. However, combined with everything else mentioned above, it was a sorry combination. I saw big tidal surges and low ebbs along with strong currents that made the water look like a flowing river at times. Our go-to area. All year long if nothing else was biting, we could always fish with our Tailhunter La Paz Fleet and 9 out’ve 10 times, the dorado would charge and fill the coolers and put smiles back on everyone’s faces. The dorado weren’t big, but they were feisty and fun. This week, in combination with the things mentioned above, the bait was hard to find and our boats would spend most of the morning look for bait. Then, the fish were all the way over the other side of the bay near San Juan de La Costa…about 20 miles away! So, chase bait all morning then a long boat ride to the other side. Then…the pangas were coming back with only 1 or 2 little dorado. Not even worth the gas. Even my captains were telling me not to fish the area! Waste of time and gas. Add to that rough seas and you have a perfect combination of bad things making for bad fishing. Hopefully, things settle down by the time you’re reading this. We we head toward the end of the season, just another big shout-out to all of our Tailhunter Tribal Family that brought down hundreds and hundreds of pounds of school supplies, clothes, shoes, dry goods, hygiene items, toys and sports items for our needy kids in schools and also our battered women’s shelter. As well, to those of you who donated money to our FANLAP scholarship program to help keep a child in school, you all rock. Thanks for making a difference everyone! Cannot find nicer folks and have more fun with this group for amigos from Idaho! Barbara and Randy Choate; Claire Ames; Gail and Dave Codding and Tom Ames. Thanks for the big hearts and smiles and thanks for spending your vacation with us! We are blessed and grateful more than you know!